I had the pleasure of reuniting with my fellow female doc filmmaker friends (LtoR: Cassy Soden, Amy Benson, Gretchen Burger) for one of my favorite on-site Work-In-Progress (WIP) gigs. 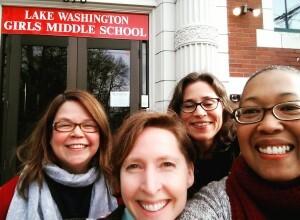 This was our 2nd year working with the 8th grade girls at Lake WA Girls Middle School, offering feedback on the short films they’re producing for their upcoming Social Justice Film Festival (Tue 2/9 at 6:30, Majestic Bay Theatres). This year, there were 34 girls working on 13 films on the following issues: Homelessness, Women in STEM, Disability, Muslims in America, Body Image, Heteronormative Bias in Children’s Television, Understanding Autism, Racism (A Social Experiment), Gender & Economics, Prisoner Rights, Ageism (Youth), Women’s Suffrage Movement. And while I look a tad crazed in my pic below (! ), rest assured the four of us left feeling completely inspired by the girls and the breadth of topics they were tackling. Look forward to seeing how their films evolve! This entry was posted in ALLY Project, Education, Engagement, Schools, WIP - Works In Progress. Bookmark the permalink.